A game of observation and speed ultra colorful and funny for children. With each turn we throw the 2 from. One of them indicates a color and the other a form. All players must then rush to catch the corresponding fish. The first player to succeed wins and places him in front of him. But beware if the fish designated by the dice is already in front of a player: you have to catch the piranha! If the one who caught it first is the owner of the fish, he eats it and turns it over on the ridge: he wins it then definitively; but if it is another player who catches the piranha, the player who owns the fish must put it back into play! The first player who ate 3 fish wins the game! 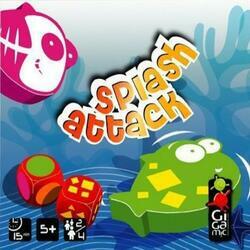 Splash Attack has been awarded the Golden Ace of the Kid Game and a TOY Award!